If one were asked to think of some adjectives to describe AC/DC, subtle would not be a likely choice. The band blew into Auckland New Zealand’s Western Springs Stadium in the evening of December 15 and came about as close to blowing the roof of the place as anyone else probably ever has. The show was so loud, it was heard up to 4 miles away. There were numerous reports from Birkenhead that claimed the concert could be heard there at times — 4 miles across Waitemata Harbor from the concert venue! 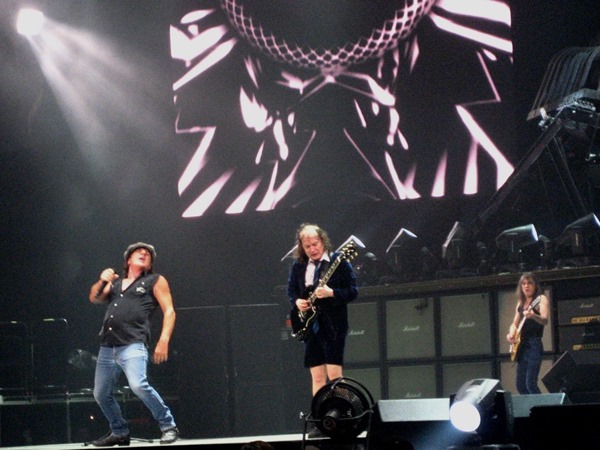 When sensitive instrumentation was used to get an accurate reading on the sound level, it was revealed that that AC/DC was blasting out their hard rock hits at 103 decibels! In addition to be heard up to 4 miles away, the sound also set off a number of car alarms outside the stadium. Officials in Auckland received a total of 27 noise complaints about the concert, but the sound remained below the 107-decibel limit that has been imposed on acts that perform inside the stadium. AC/DC was the loudest event to take place there recently, and easily bested Foo Fighters who were measured at 98 decibels, Eminem who clocked in at 101 decibels and the Big Day Out Festival, which matched Eminem with 101 ear-splitting decibels. Next year AC/DC will embark on their “Rock or Bust” tour, which will take them to Europe and the United States. They are set to be the first group to perform at London’s former Olympic Stadium following its renovation. No matter what happens there, one thing is virtually guaranteed: It’s going to be a loud show. Perhaps the lads can play loud enough to ring Big Ben.